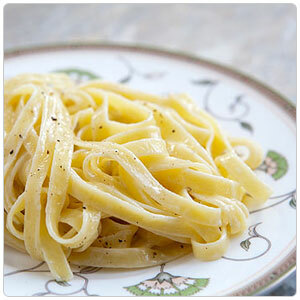 Fettuccine, literally "little ribbons" in Italian, is a flat, thick noodle and slightly wider than Tagliatelle. Traditionally, fettuccine is served with slow cooked meat or chicken ragu or sugo but pairs well with cream or butter based sauces also. Drop pasta in a pot of rapidly boiling salted water until just cooked. Strain pasta and add to sauce, ragu or sugo. Finish cooking the pasta and sauce/ragu together until done. Fettuccine is a very popular pasta in Roman cuisine and most known for the traditional dish, Fettuccine Bolognese, where the pasta is perfectly paired with a slow cooked meat ragu.